One of the many incredible experiences I had as a Peace Corps volunteer in Kenya (Kaimosi). I was a Peace Corps volunteer a decade ago and it was one of the most important and impactful experiences of my life. As designed and established by John F. Kennedy in 1961, the Peace Corps provides technical assistance, helping people outside the United States to understand American culture, and helping Americans to understand the cultures of other countries. When I volunteered, there was a lot of emphasis on the fact that the three goals of a Peace Corps Volunteer were equally weighted, in other words- yes, you were there to help, but fully two-thirds of your “job” was to learn and share. Learn from the host country about their values and experience and to share American values and experience. Being was as important as doing. Well, it’s occurred to me that it is time for a Peace Corps reboot, or better yet, a new agency altogether. The Peace Corps was conceived at a time when America was perceived (at least by us) as the pinnacle of society. A shining example of industry, ingenuity, strength, and progressive values- in short, a place to be admired. And to be sure, we remain an economic powerhouse and we can consume consumables like nobody’s business (too bad that’s not an Olympic sport), but we have begun to falter in a lot of important ways. Where to be born? Well, we beat UAE and South Korea, so we’ve got that going for us, which is nice. I am sure everyone has seen those lists about the countries that are top for education, health-care, life-expectancy, quality of life, gender equity, infant mortality, renewable energy, and gun-deaths. 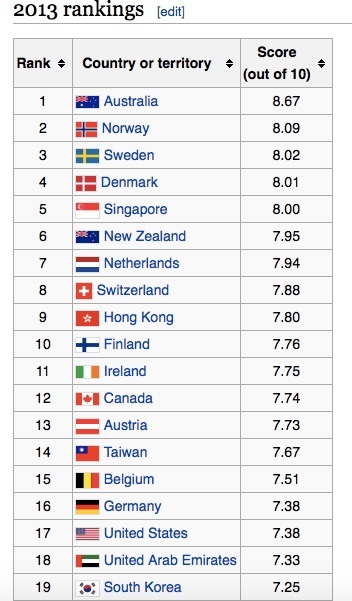 Perhaps the one list to rule them all is the Economist’s Where to be born list (we rank a disappointing 17th in 2013). On many of these lists, we are not even in the top ten but we should be and we can be. For the long-term health of the nation, I assert we must take action to improve our standing on these lists. I think what we are lacking, is a model. The US is so vast and insulated; and because it’s so huge, we “travel” within its borders- Disneyland parks had over 30 million visitors last year. As my time as a Peace Corps volunteer in Kenya taught me, and the many thousands that have served in its 50 years of existence, it’s hard to conceive of another culture until you live in it. As that famous aphorism says, “Never judge a man until you have walked a mile in his shoes.” Well, we need to do some walking in some different shoes. There is a visceral understanding that comes from living in a place with no electricity, no running water, no tarmac road, minimal infrastructure, and no organized social safety net that makes you inestimably more grateful for what we have here in the United States. I also continue to feel incredibly privileged for all that I learned from my time in Kenya, lessons that I still apply in my personal and professional life. And yet, there are those lists. The lists that suggest (perhaps even prove) there could be an even better way. Given America’s great history and tradition of competitiveness (JFK was also instrumental in the race to land a man on the moon) and our desire to be number one, I would like to humbly call for the creation of The Equal Society Corps (I was going to say Better Society Corps, but the initials invite too many jokes). The mission of the ESC would be similar to the Peace Corps, but we would go to countries that rank high on aforementioned lists. Imagine sending the best and brightest of our nation abroad for a couple of years to get a real understanding of what a more equal, more fair, more sustainable society looks like. Rather than teaching about water sanitation, hygiene, and disease prevention, ESC Volunteers would learn what it is like to have access to health care, child care, a retirement fund, and an excellent education regardless of your (or your parent’s) station in life. I think one reason that Americans struggle against estate taxes, is that we know that our system is highly unfair and being born near or at the lowest end of the economic scale burdens you with a huge list of disadvantages from birth. A burden that for millions of Americans is impossible to shed and that will effect the quality and length of your life significantly. We need to start changing the reality of this ugly truth. Of course, this list and idea isn’t to say that America doesn’t have many incredible things going for it. Obviously, we are a powerful nation and our economic & technological production over the years has been nothing short of phenomenal. Think of many of the biggest and greatest companies in technology and most of them were founded here. Not to mention the contributions we have made in times of world conflict, particularly during WWII. It’s also not to say that this list of countries doesn’t have it’s own host of challenges. Many of these countries are smaller with more homogenous populations, some could be states within the United States. Certainly, there is no “perfect” country and we should use our learnings from these countries to continue our quest “to form a more perfect Union”, as enshrined in the preamble to our Constitution. Just as those who join the Peace Corps are motivated by a healthy dose of idealism, so would the Equal Society Corps be motivated by a desire to better themselves and the world around them. Peace Corps volunteers have also always had strong backs, open minds, and willing hearts- qualities that would serve volunteers well in this new, next generation mission. I shared the idea for this story with my dad, and he said, heck, he’d like to go. As someone closer to 80 than 75, even with an excellent personal economic outlook (including a pension and retirement savings), he is thinking about what elder care options there are for him in the United States. Probably more than anything else, older parents in the United States do not want to be a burden to their children, and yet- with long life expectancy but often complex and expensive care needs- needs that would have been difficult to cope with at peak income levels, to say nothing of retirement income, their worst fears are being realized. For my generation, the outlook is far, far worse. Please share, comment, and maybe get ready to pack your bags!